This week will present you with numerous opportunities, which if taken at the right time could yield you great benefits. Businessmen and working professionals will both get equally good benefits. Passionate love life is predicted for you but domestic life might go a little flat. Short trips are possible and financial life of the natives will remain good. This week advises you to maintain transparency in love relations. Avoid being stubborn. The first day of the week will be auspicious for you, although you’ll have to be very cautious in the coming days of the week. Stay pure and restricted. The second half of the week would lure you towards religious activities. By the weekend, the balance between work and love life will get stable and you’ll feel more relaxed than usual. Remedy: Don’t lose your temper. You’ll have a happy and content week. You’ll be satisfied with what you’re getting in this duration. Professionally, you’ll grow, and will be entitled for a smooth development. Befriending new people is on the cards for you. You’ll meet some inspiring people in this week, which might play a pivotal role in your personal growth. Friends might give you a surprise visit. Students, this week will get desired results. Love life will be gleeful. This week will be favorable for love affairs. Keep your tongue tied and your feelings restricted, as they might be taken otherwise. Married couples will have a gleeful time, as this week predicts great things happening for them. Start of the week will be very auspicious. Whereas, due to your own mistakes, you might have a bleak end of the week. Keep yourself restricted. Your financial life will be quite stable, as income generation won’t be a problem for you. Senior colleagues might spun trouble for you; an argument with them is also quite possible. You might contract some seasonal diseases in this week, so keep your well being in mind. You’ll befriend new people and some important delegates which will benefit you in the long run. Your love life will be more or less static but you shouldn’t think about a drastic or a big change. You should not let your wild thoughts dictate facts. Tiffs and arguments are possible this week. Your week will start in the pretty well, mid-week is sort of a mixed baggage for you, while the end of the week looks pretty bleak. Remedy: Take care of your health. You might be stressed due to your personal life but nothing much to worry about. The professional life of the natives is going to be great in this week, if you work diligently and efficiently towards it. Think carefully before speaking, to avoid embarrassing situations. Do not trust people blindly. If you do not go about things in an astute manner, you could be in for bad blood. Watch your tone, try not to be too loud & impertinent. Your week will start on the bright side, so don’t dwell about the past mishappenings as it will only sadden your mood. The mid week will comparatively be better but the week will end on a high note for you. Married couples will have a good time. Remedy: Maintain peace & calm. Pending work will get completed. Some relatives might come to your place this week. Try to avoid any kind of argument with seniors. Plan a surprise for your lover to strengthen the bond that you share. Children might get stubborn this week. You could stay a bit worried this week due to some personal or family affairs, due to which will not let you spend much time with your lover. This shouldn’t happen because you will have to perform a balancing act between problems & love because you have certain responsibilities on you. For those who’ve been thinking of proposing someone, the time presages great things happening for you. The start of the week will be great, mid of the week will be pretty dull but the end will leave you on cloud nine. Remedy: Be careful at workfront. Go to a pilgrimage or anywhere that will soothe your mind. Overthinking is not going to get anything helpful. Spend some quality time with your loved ones and surprise them with a gift. You might buy a vehicle or do some shopping for re-decorating your home. Have faith in God and believe in karma. This week will provide you with mixed results. Do not let go of any opportunity you get to enjoy & have fun with your partner. Don’t let ego or any attitude breathe between you and your partner. At the beginning of the week, try to have food together, this will strengthen your bond. At the mid week, you could go for a romantic movie. It’s advised that you don’t let your neighbours have any say in your life, as this week their hawk eye will be on you. The end of the week is going to be pretty boisterous. Remedy: Take a break from work and relax. You have to ignore your casual behavior to avoid unnecessary losses. Learn how to manage your personal and professional life, if you really want to have the best of both worlds. Avoid hasty investments and if possible, postpone them. Avoid liquor. Proper anger management is required is required this week. This week promises to be very rewarding for those, who’re in love with their colleague. You’ll have to be vary of your tone, as it could cause havoc in your love life. The beginning of the week looks gratifying, but mid week could be problematic. You’ll face plenty of mood swings in this duration, but due to your partner’s understanding nature, you won’t face any problems in your love life. Weekend promises better things to happen for you. Remedy: Balance your personal & professional life. You will feel more inclined toward spiritual activities. You are going to spend great time with your beloved. However, students need to work more to get desired results. Businessmen as well as those who are working in corporate world are going to get profits. This week will comparatively be better, although you are advised not to get impulsive if things don’t pan out the way you want them to. At the start of the week you could find it very tough to meet your partner, normal call & video calling are some great ways to get past that. Mid week will bring you lukewarm results, whereas the week will end on a positive note for you. Remedy: Put more efforts to get desired results. Thinking is a necessity, but overthinking is harmful. So avoid analysing everything so critically and things will be in your favor. You should go out and enjoy with people you are comfortable with. Popularity will prevail in life of people who are from creative background. Love is in the air. Stay far off from any quarrel. Keep a tab on your anger & never doubt your partner. Although things will be smooth at the start of the week, due to some reason you could find it really hard to meet your beloved. Mid week looks pretty stable as well but you will have to keep your emotions in check. Try sweet talking your way out of all your troubles, come the weekend. In this week you will get what you have worked for. Your hard work will not go in vain and will accomplish your goals. If there was any pending debt, you will get your money back. Friends and siblings will prove to be a great company to hang out with. You might go for a pilgrimage. This week could get you drunk on love, do not mull about a particular thing as that could be the thorn in your side. Ditch the stubbornness to enjoy the week to the fullest. 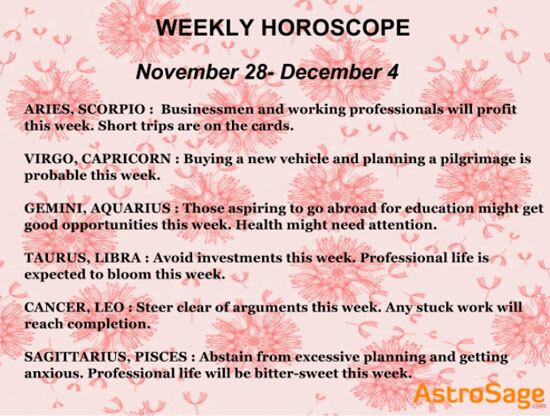 Understand your partner and make good use of your romantic side this week. The week will start with an aplomb, mid week could lure you towards travelling.The end of the week will give you serenity & peace of mind. The chaos of the week will wash off by the weekend. Remedy: Drive carefully and follow traffic rules. Love life as well as the professional life of the natives will blossom in this week. You will enjoy this week a lot and might plan some surprise for your family. Take care of your health even if there is nothing to worry about. Students can now plan to go for higher studies in abroad. The week will be pretty satisfactory for you. If you are alone & searching for your perfect match, choose wisely. The start of the week looks pretty solid but if you find yourself falling for a co-worker, be careful. Mid week will provide beneficial results, you will be able to speak your heart out. The weekend could be a nightmare for some, if words spoken are not well thought. Remedy: Overthinking should be ignored. You might face ups & downs in your professional life. The natives might feel a little sad at times so it’s advised that you avoid such situations which make you feel that way. Improvement in all stratas will be observed at the end of the week. Cooking will attract you and you might spend on household. This week will be quite indifferent for you in many ways. The week could be pretty shaky in the beginning but as the days will progress, your love life will be in ascendancy. You will have to strike a balance between work & love in mid week. Come the end of the week, you will be able to bare your heart out to your partner, which in turn will help you establish a rock solid bond. Remedy: Avoid negative situations and people.